Having cancer is terrifying. Period. Often, well-intended doctors find themselves unable to mitigate this panic. As humans we are challenged with this disease as old as our chromosomes, struck at the core of our identity, of our body, of our sense of self. We are removed from work, from a normal agenda, from our families, from our mirrors. We learn to fightwith something inside of us. We learn to split ourselves apart. However, there is one part of ourselves that can always be preserved, always untouched, always whole: our dignity. Time and again studies show that dignity—defined in a multiplicity of ways—is one of the main elements that help patients cope with serious or advanced disease. Dignity has been linked to quality of life, symptom control, and even survival. Dignity can help patients engage to surmount challenges, like days filled with hours of chemotherapy. Dignity can help confront news when they are not as expected. Dignity can be the distinguished silence with which patients assertively prepare for their passing, and become examples of bravery and acceptance for their loved ones. As a palliative medicine specialist, I see that one of the main hazards for patients’ dignity is lack of communication. Well-intended families and doctors protect patients from real discussions about what to expect from their treatments. This is particularly frequent of those cancers with poor prognosis and when therapies with only limited benefit are being offered. To have a voice in one’s care, one needs to be aware. Medicine has shifted from a paternalistic model to one of shared decision-making. The way we transmit information in cancer has to change in this direction as well. Studies have shown that the majority of patients undergoing serious chemotherapy treatments for diseases as complicated as advanced lung or colon cancer do not understand what is the goal of these drugs. Receiving 4-hour infusion 3-drug cocktails with an intention to cure versus an intention to halt disease for some time are two very different scenarios, which will weigh differently for a patient against serious side effects. 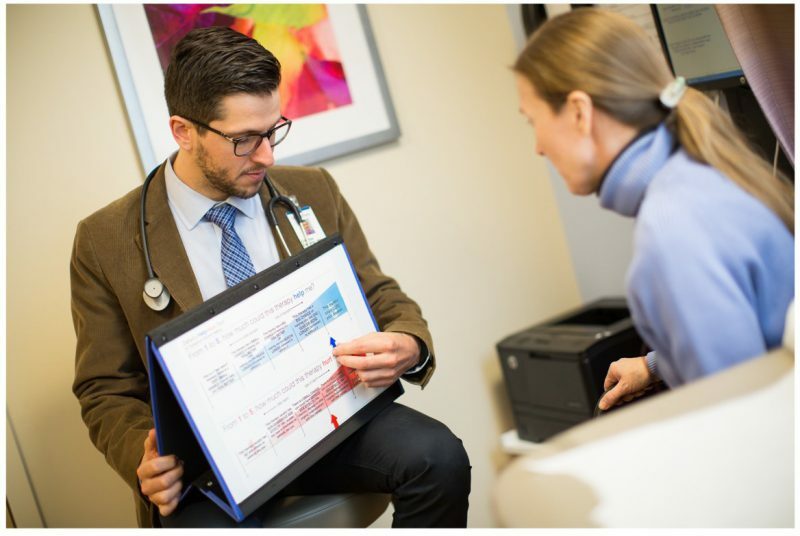 With an ever-changing field such as oncology, and with doctors rushing to keep up with new and exciting options for patients, the complexities are immense; trying to deliver nuanced and delicate information about treatment options to patients, while the pressured clock of the doctor’s office and the often unjust clock of the patient’s time are both ticking. The Help-Hurt tool (helphurttool.com)was created by palliative care physicians and oncologists at the Montefiore Einstein Cancer Center as a way of bringing accessible and transparent information inside the doctor’s office when a new therapy is being presented. Although initially thought for cancer, we believe it can be used for any serious disease for which a treatment plan is being discussed. The logic behind this tool is quite simple: every single treatment in medicine—whether it be an over-the-counter tablet of 100 milligrams of aspirin or open-heart surgery—possesses a potential benefit and a potential risk. Cancer treatments of course don’t escape this. In regards to benefit, some cancer treatments provide promise of cure—like chemotherapy regimens for many malignancies originating from blood cells or for initial stages of some organ cancers. On the other hand, some cancer treatments offer only some more time of survival without growth of the disease, therefore extending life and improving symptoms, but not a cure. This time can be estimated in years, months or, sadly, just in weeks. And in some instances, a cancer treatment is just a desperate attempt at “trying something else,” either at the persistence of patient and family, as a source for hope or as an understandable—yet not frequently justified—need for a doctor to send his patient a message of non-abandonment. The ways cancer treatments can harm also vary significantly. For instance, drugs like hormonal blocking agents seldom produce dangerous side effects. On the other hand, chemotherapy infusion drugs like Cisplatin can be difficult to tolerate and lead to more side effects. Generally a patient that is older and/or has more medical issues will tolerate these drugs worse than a healthy/young patient. We do not possess absolutes in prognostication in medicine. We can never be sure how much a therapy will help or hurt a patient. Every so often a frail patient can make a fantastic recovery from an aggressive intervention, and on the other end, a healthy patient dies from the unexpected complication of an otherwise low risk procedure. But these are of course not the most likely scenarios. In medicine we often know what will be the most likely scenarios, we can talk on averages, a.k.a. the most likely result of a treatment or intervention. But regardless of information being imperfect, don’t patients deserve to know these expectations? Should we leave the knowledge that allows us to know what to expect only at the doctor’s side of the table, and leave patients always in the unexpected? The answer that this proposed tool gives to this question is: no. Clinical experience gives doctors the capacity to formulate a judgment. This judgment is usually the result of adding the information provided by evidence-based medicine regarding the usual result of a treatment plus the patient’s known circumstances (old vs. young, frail vs. strong, healthy vs. sick). The Help-Hurt tool offers doctors a chance to express this opinion to their patients. This way patients can become better decision makers, importing the physician’s realistic clinical judgment in a useful way. Let’s look at the tool. As you can see, the tool has two scales. The first one in blue: “how much could this therapy help me?” rates from 1 through 5 the positive outcomes to be expected from a therapy. The higher the score, the more beneficial a treatment is expected to be. A score of 1 represents a “last resort” therapy, a very small chance it could help you feel better. A score of 2 represents a therapy with a small chance of making you feel better OR with a chance of helping you live weeks longer compared to without it. A score of 3 represents a therapy with a big chance of making you feel better OR with a chance of helping you live months longer compared to without it. A score of 4 represents a therapy with a big chance of helping you live one year or longer compared to without it. A score of 5 is for a therapy that could cure a disease forever. As you can see, between being offered a therapy with a score of 1 or 2 versus one with a score of 5, there is a world of difference. How much burden would you expose yourself to depending on being offered a therapy on one or on the other end of the helpspectrum? 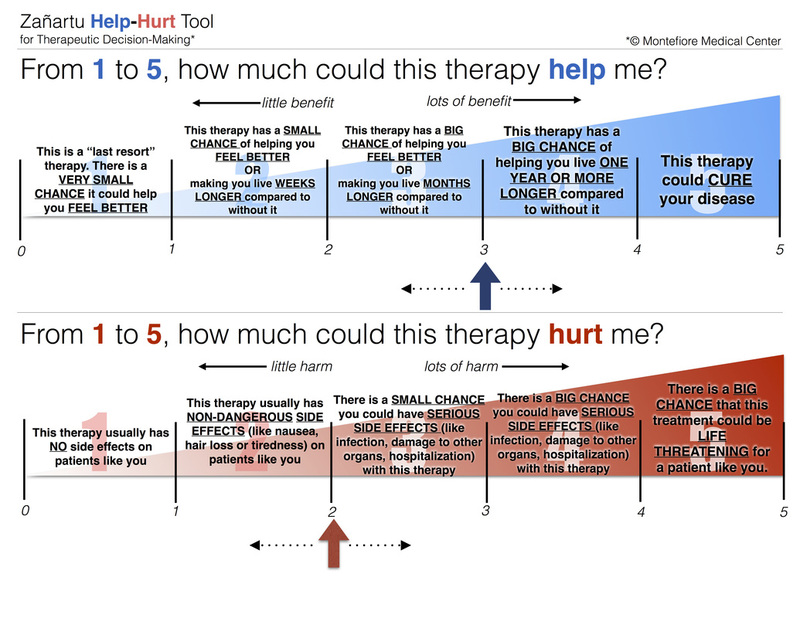 The second scale offers the same logic for expected harms of a therapy, in red. How much could this therapy hurt me? The higher the score, the more harmful the treatment could be. A score of 1 represents a therapy with usually no side effects. A score of 2 represents a therapy with non-dangerous side effects like nausea, hair loss, acne/rash, or headaches. A score of 3 represents a therapy with a small chance of serious side effects like infection, damage to other organs, or other complications requiring hospitalization. A score of 4 represents a big chance of the same serious complications. Finally, a score of 5 represents a therapy that could likely be lethal or life threatening itself. As you can see, every single possible outcome written on the tool is expressed in chances or probabilities. Again, your doctor will never be absolutely sure of how a treatment will help you or hurt you, but these are the most likely scenarios. By knowing them, a patient can make a better informed-decision. On the bottom of both scales there are arrows that can be moved over to particular help and hurt scores. That way a particular therapy on a particular patient is given the expected scores on both the help and the hurt scales. If different therapy options are on the horizon, a set of help and hurt scores are given for each therapy. For example, therapy A has a help of 3, but a hurt of 4. Meanwhile, therapy B has a help of 4, but a hurt of 5. Ideally, therapies would have a high help score and a low hurt score. However, that is not always possible in medicine today. Often, as diseases get worse and patients sicker, the help score becomes smaller and the hurt score higher. Incorporating such reality into the conversation is hard, for both patient and doctor. When confronted with cancer, patients need the comfort of being told things are going to be okay. And okay usually means getting rid of disease. Doctors feel the need to give that message. The expectation is for medicine to make a big difference, to save the day, to save a life. Hopefully this tool will be there to display high help scores and low hurt scores when likely successful plans are being offered. But when this is not case: how can doctors be comfortable saying: “this therapy will help you marginally, this other will help you little, this one might just hurt you a lot.” Doesn’t seem like this is what doctors were trained to say. How do we keep hope while giving realistic information? The answer to these questions opens a whole other can of worms, one this article is unlikely to resolve. How can we re-frame hope when people don’t get better? Have you ever been to an ICU ward? It has a lot of reality, often times little hope. Can we build a hope that transcends old and young, sick and healthy, death and alive? Can we dare to believe in a hope about who we are? About what we are truly worth? About what we truly mean to the others we have met and loved? When hopes of achieving a cure are lost… can we hope to remain ourselves through the challenge, to keep our light on, to rise to the occasion with a body hurt by disease but a dignity intact?